Every time I teach one of my RCP classes I take some time to discuss the Nebula project. An RCP application is not complete without at least one of these beautiful widgets. In our own applications we make extensive use of the Nebula project. About a year and a half ago I managed to get one of my own widgets in the project as well and so i became a Nebula committer. Yay! Tom, Nicolas and others did a lot of work restructuring the project at that time but it got stalled. IIRC this was mainly due to problems getting the Eclipse infrastructure working for us and Tom being buried in e4. However, this left us with an unfinished build, no official download site and as a result some of the widgets were self-hosted. In the mean time new widgets were offered to the project that did not get enough attention. A few weeks later, Tom send a message to the list. After pondering it for a while, I decided to volunteer for the position as project lead on a temporary basis (read: you will never get rid of me). Since then we managed to get the project going again. My first action as wannabe project lead was to move forward with Mickael Istria's Treemapper that was waiting to be accepted. I filed a CQ to the EMO to get the Treemapper through the IP process. I could not know at the time that this was a smart move because Mickael proved to be a build magician and together with Nicolas we managed to complete our (Tycho) build, with test, signing and upload to the Eclipse download server. There are now only a few seconds between a check-in and the availability of the code on the Eclipse download servers. The next steps in the restructuring was the move to git, restructure and refactor of the widgets (we are no longer in the swt namespace), the completion of the restructure documentation and finally the proposal of the new project structure. 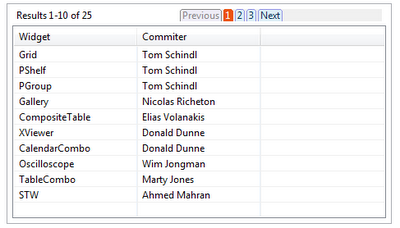 Mickael's TreeMapper widget can be used to link entries in two trees by using drag and drop. It can be used for mapping fields to tables, users to capabilities, eggs to sausages, and so on. Read all about it. A widget made by Angelo Zerr and Pascal Leclerq. It is a widget for easy picture control. It enables upload and display of a picture and, it also runs in RAP. Read all about the Picture Control. 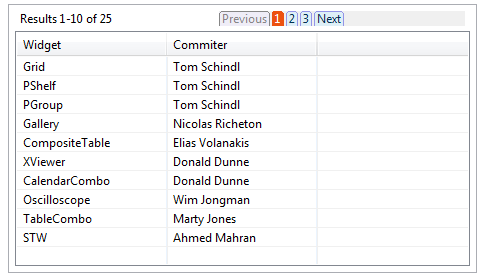 Another brand new widget by Angelo and Pascal is the Pagination Control. There are some good use cases when you have to work with large data sets. We know the pagination paradigm from the web but why should that not be available on the desktop. So here is a good alternative to lazy content providers and virtual trees and tables. Did I already mention that it also runs in RAP? Read all about the Pagination Control. Now it is time to wait for the legal stuff to happen in the NatTable proposal. NatTable is currently self-hosted so go over there and take a look. We have been using NatTable in our own product and we are very happy with it's versatility and speed. All the better that this is coming to Eclipse Nebula. Edwin Park will be the lead of the sub-project and we are looking forward to find a good place for NatTable in Nebula. Checkout the widgets by downloading them from our update site. Make sure to also include the example view and the examples of these widgets.